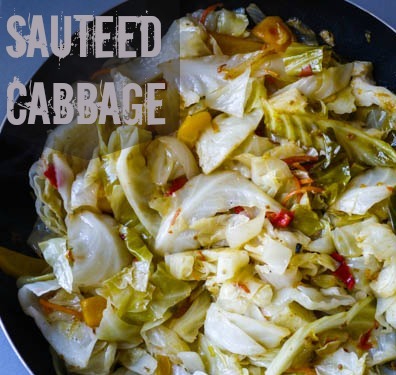 There was a period of several years that I couldn’t go anywhere near cabbage. A friend and I decided to go on this cabbage soup diet. We got a ton of ingredients and I made this giant vat of cabbage soup for us to split. Day One is always “Oh my God, this is sooooooo good!!!!111one! I can’t believe I can have as much of this as I want and that it is a diet! nomnomnom.” By Day Three, you’d rather have each and every one of your teeth pulled out with rusty pliers than look at another bowl. And of course, if you even THINK about eating regular food, you put on 10 additional pounds, so it was all a big waste of time anyway! Anyhow, when I finally returned to eating cabbage, I returned to the cabbage dish of my youth. I don’t know if this is exactly the way my mother makes it, but the ingredients sound about right and the taste is spot on. We would traditionally eat this for breakfast with meat and some other sides, but it also goes really well with grilled chicken or Kalua Pig. 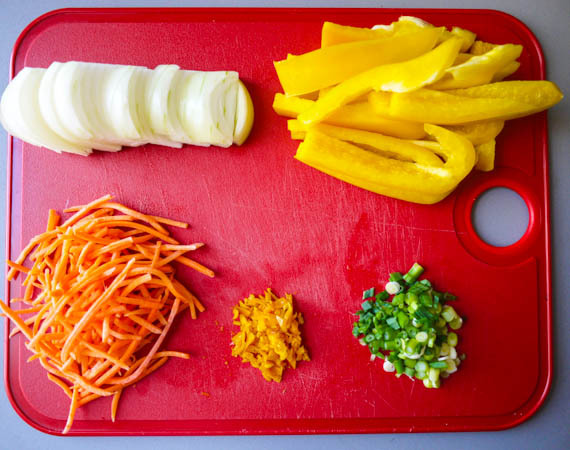 Chop your onion, scotch bonnet pepper, bell pepper, scallion and carrots. 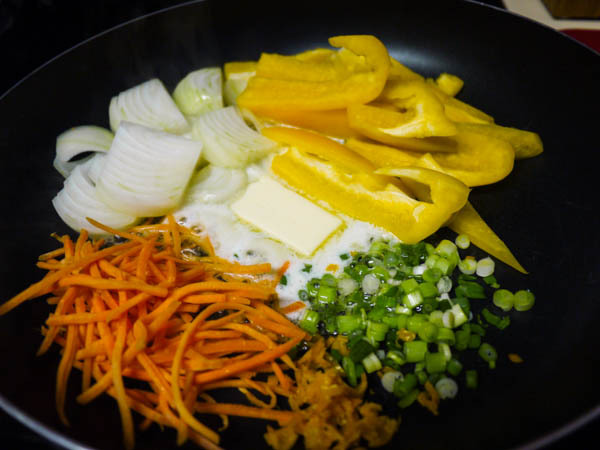 Add 1/4 cup butter to a large skillet and add your chopped veggies. Sauté on medium high heat for approximately 5 minutes. You just want everything coated with butter and slightly browned. 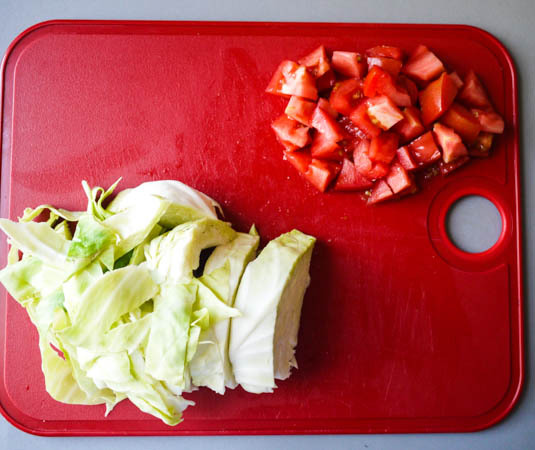 Chop your tomato and cabbage. 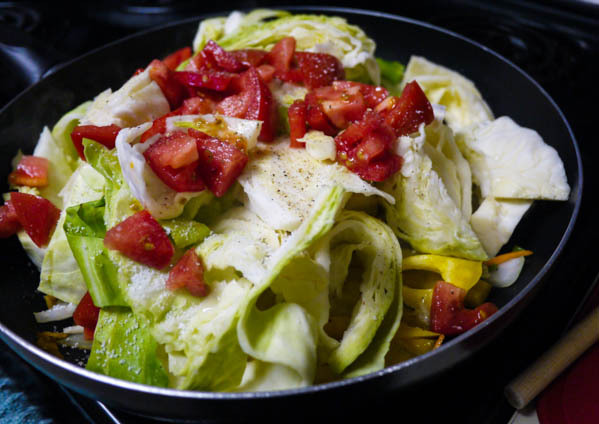 Add tomato and cabbage to the skillet, along with sugar, water, salt, and pepper. 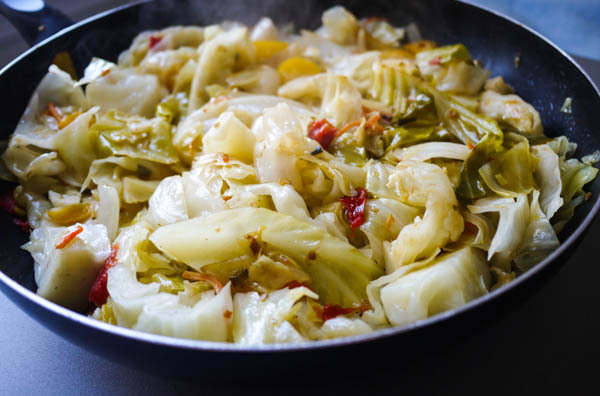 Cover and cook on medium high heat for 30 minutes, stirring occasionally, until cabbage is tender, but still slightly crunchy. 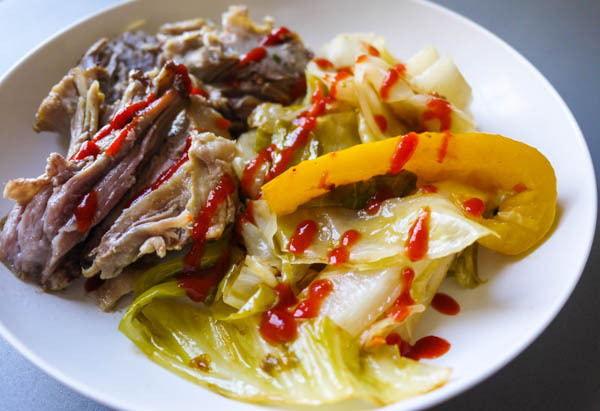 … or with some Kalua Pig and a squeeze of sriracha! 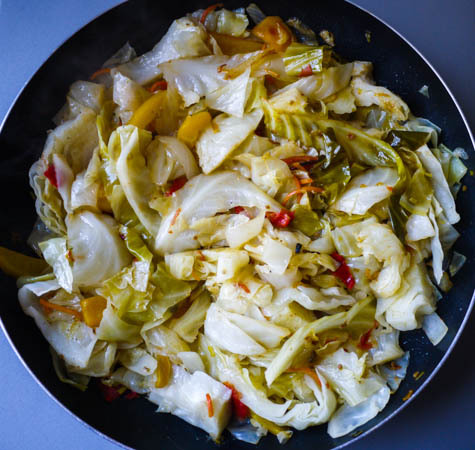 Cabbage sauteed with hot and sweet peppers, onions, tomatoes and little bit of sugar. 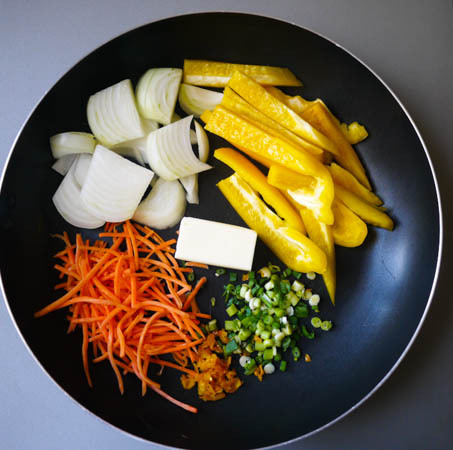 Add ¼ cup butter to a large skillet and add your chopped veggies. Great job Tekesha! and I thought you never paid attention when I was cooking. The only thing I never add was the sugar but I can imagine how it brings out the flavor. Next time I’ll try it! Love your presentation and creativity!